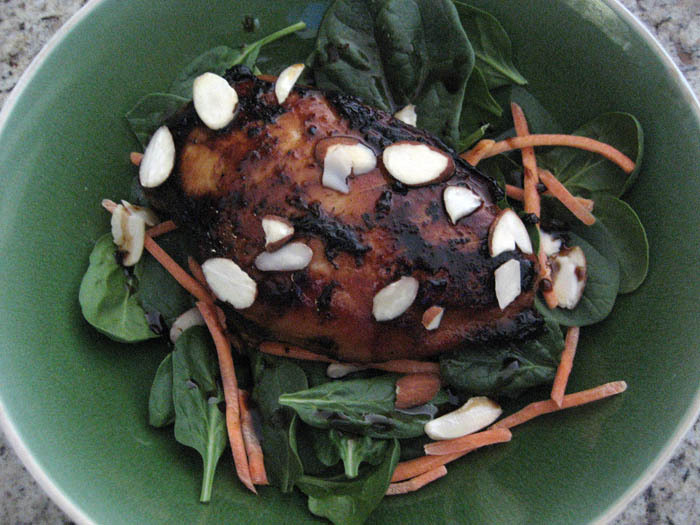 I thought because this recipe had the word “detox” in the title and was chicken it would qualify as Paleo, but then I saw the agave nectar on the ingredient list. Oh well, I’d already committed. This still has to be healthier than a typical teriyaki recipe and it’s so fricking easy. Well, it’s easy once you locate the mirin and barley miso in the grocery store. I just assumed I had to go to Whole Foods for it and had no trouble locating both in the Asian foods isle. This recipe came from the website Goop, a side project of Gwyneth Paltrow, which I guess explains the use of “detox” in the title. I swear that woman is always detoxing or on some snobby diet. We’ll ignore this unfortunate side plot and continue with the recipe, which states that it is for one chicken breast, but it is lying. You could easily do four with how much marinade this makes. I know it instructs you to save some to pour over the chicken, but ain’t nobody got time for that. You don’t need it. Ok, fine, it makes a decent dressing if you want to make a salad out of it all, but then you won’t have enough to make four chicken breasts. I am so in love with this chicken. It gives me the teriyaki flavor I want without all the sugar. In fact, I don’t actually use the 1/3 cup agave syrup the recipe calls for. I use 3 tablespoons. If you want yours sweeter – knock yourself out. If you don’t have agave nectar, try honey. Either way, this teriyaki sauce is not overwhelming sweet and syrupy like it can be at restaurants. If you make this on the grill or in a cast iron skillet it gets a really nice crust on the outside. I always let this marinade overnight. Marinated meat is much like chocolate chip cookie dough – it’s better if it sits overnight and even longer if you can stand it. Hey! Look at that: commonalities between baked sugary sweets and meaty Paleo meats. As a single hungry lady living all by myself (um, don’t tell robbers that), I just grab the chicken out of the fridge as I need it and cook. 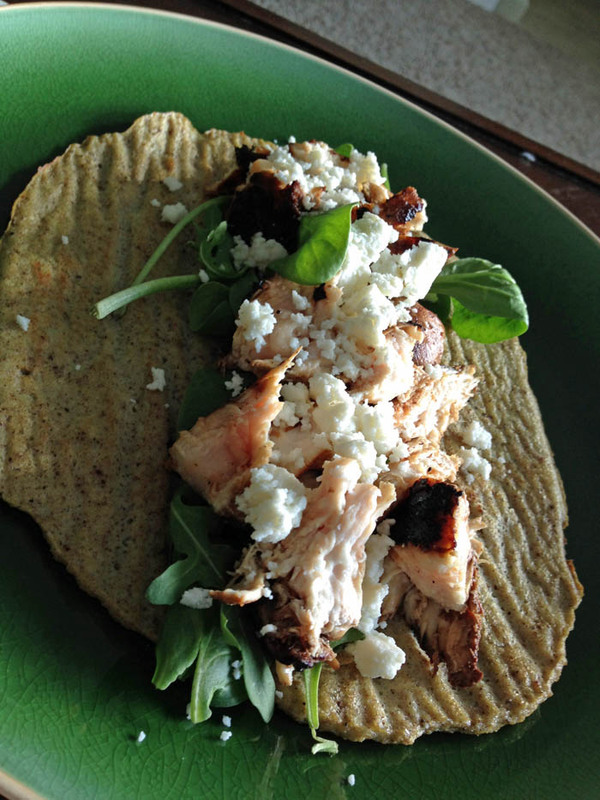 Have you noticed spinach in all my Paleo posts? Shocker: I eat this over a bed of spinach and arugula, BUT now I can get creative and wrap it up in a cauliflower wrap! I promise sweeter posts are coming soon. To make the marinade, combine the balsamic, agave, ginger and pepper in a small saucepan. Bring to a boil, lower to a simmer and cook for ten minutes. Cool and then add the miso, mirin and water. Make sure to break the miso up so there are no chunks left. Place chicken breasts in a plastic ziploc bag. Pour cooled marinade into the bag, seal, message the marinade into the meat a bit and place in the refridgetrator. Let sit for at least two hours, but get full flavor and tenderness when left overnight or longer. Heat your grill or pan to medium heat. 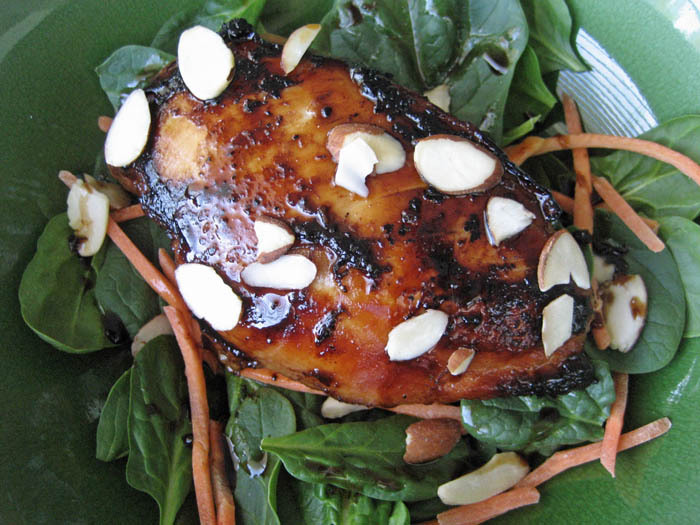 Allow any excess marinade to drip from chicken breast before placing on grill or pan. Cook chicken for 3 to 4 minutes per side, or until cooked through.